Need a gift for your favorite writers? Everyone who writes for a living knows that drinking caffeine in some form is almost a requirement for the work. Coffee, soda of choice, or tea can be found on almost every writer's desk, usually perched precariously close to the keyboard! The perfect cups are sometimes difficult to find. Here is a small selection of cups that might fit your desk and personality. My favorite coffee cup is the No Jobs coffee mug pictured here. It loudly proclaims that I don't want a job. After all, I'm too busy making (or trying to make) a living with my writing and my editing work. 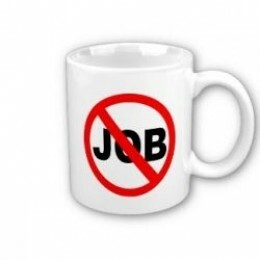 It also works well as a mug for the entrepreneur who wants to make a living by unconventional means. but I have to have my coffee! Great Gift Idea for the Writer in Your Life! This great Starter Button mug lets the truth out. If you can't get started in the morning (like me!) without your cup of coffee, this cup is perfect for you! Admit the truth, and get on with your writing day! The cup comes in 11 oz. and 15 oz. sizes. So whether you want a smaller cup so that the coffee stays hot till it's gone, or a larger cup to reduce trips to the coffee pot, this cup is great! that spends hours working on a computer. With writing, there is so much to do. Research keywords, find or take photos, build article pages, then promote or refresh the articles--there's always something that needs to be done! Your time is limited and you still have lots to accomplish so sip your coffee while working through the activities that make your articles climb the ranks and become profitable! When things begin to get overwhelming, take a sip of coffee from this Keep Calm mug and relax! A writer's best friend, after a computer or typewriter, is a coffee mug--preferably filled with the writer's favorite hot beverage! Do you prefer coffee, tea, or soda while you write? Find the perfect writer's mug on Amazon!